My poster for Malcolm’s talk. 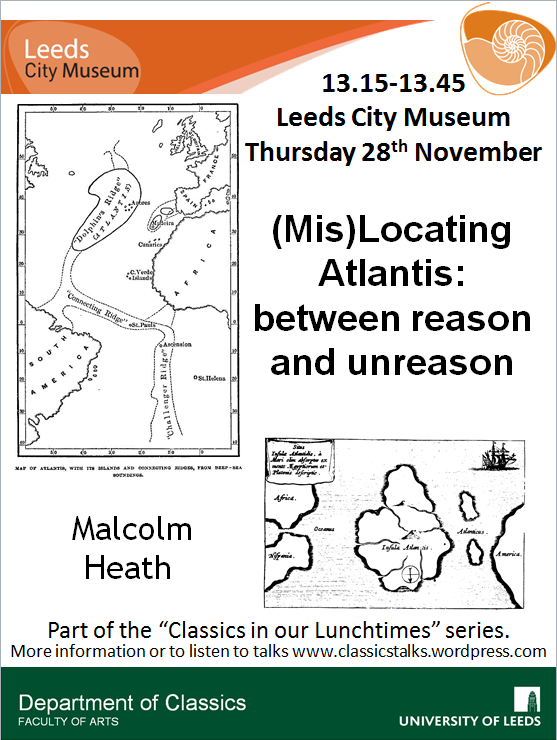 Malcolm Heath talks about the many places in which Plato’s mythical community of Atlantis has been located and explores the reasons underpinning these decisions and what they reveal about the logic and ideological positions of their originators. The talk provides a fascinating insight into the history of ideas and the relevance of apparent “crack pots” for understanding wider ideological contexts and their historical implications. This talk expands on the material used for Light Night 2013, taking it beyond the Victorian period.